Apple is once again finding itself on the defensive about its proposed Irish datacenter, with some critics charging that the company picked an arbitrary safety distance from nuclear facilities. A rendering of the proposed datacenter. 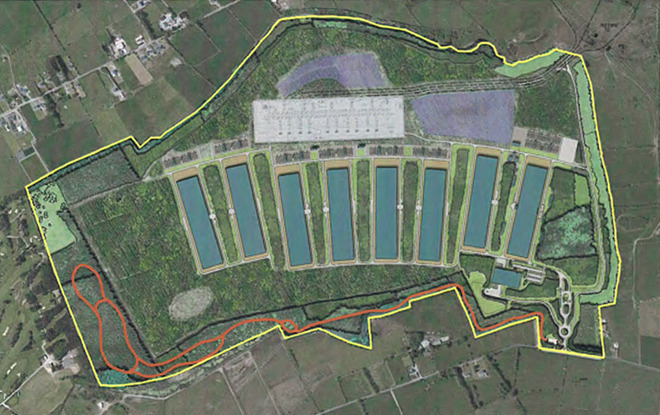 Apple wants the datacenter to be at least 320 kilometers (about 198.8 miles) from such facilities, according to a document seen by Business Insider. A number of people opposed to the proposed location —near Athenry in County Galway —have suggested that Apple picked the safety distance to avoid choosing other plots, remarking that Apple doesn't apply the same policy in the U.S., and that other multinationals like Google and Microsoft don't use this limit either. One opponent pointed out that nuclear facilities are in fact within the suggested safety range, something Apple's own Oscar Gonzalez acknowledged in a witness statement. He specifically cited the closed Wylfa power station in Wales, which he identified as 305 kilometers away, although BI's own measurements put the distance at 280 kilometers. Attempting to rationalize discrepancies, Gonzalez said that the company's site selection criteria has evolved in the wake of disasters like Fukushima, and that some U.S. sites might not have been chosen under current policies. He added that Apple is trying to minimize the threats to its infrastructure, but "reluctantly accepts the increased risk" if a nuclear facility is within the safety range of a site that otherwise meets selection criteria. Although County Galway's council has already approved planning permission for a datacenter, that decision is currently under appeal. Many people have raised concerns about potential environmental and power consumption issues.